The Mobile Health Assistant has been developed by Fraunhofer researchers to provide support for patients with chronic illnesses. Comfortable and easy to use, the Assistant is designed to aid patients 24/7 a week. The Mobile Health Assistant is a piece of technology that employs sensors and telemonitoring services to tailor therapy to individual patients. Based on continuously measured vital parameters, the services can include a personal trainer, who gives tips for a balanced diet or provides an exercise plan via a mobile device (smartphone). While we initially focused on patients with cardiovascular diseases and unclear syncopes, we have also found the Assistant to be useful in the support of patients suffering from adiposity, hypertony and other diseases. These patients require data on their heart rate, blood oxygen saturation, blood pressure and pulse. ECG-Shirt with dry electodes woven into the elastic fibers of a sensor shirt and flexible electronic circuit board. The Mobile Health Assistant comprises a sensor shirt and a wrist-worn plethysmograph (a device to measure SpO2, blood flow and heart rate.). The shirt is designed to be worn both day and night. We meet hygienic requirements by using elastane fabric, which can be washed in standard washing machines at 60°C. Four special electrodes are integrated in the shirt: one on each shoulder and two at the bottom of the costal arch. The so-called dry electrodes were specially designed for the shirt, and make special electrode fixation or contact gel superfluous. The shirt also contains a three-lead Einthoven electrocardiogram (ECG), processed by a flexible electronic circuit board. The gathered data can be also stored and wirelessly transmitted via a Bluetooth connection. 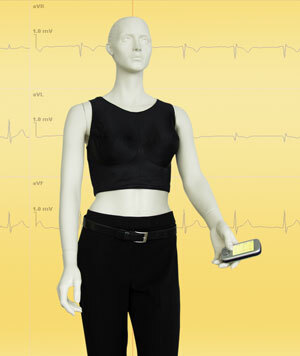 While several cables are required for the connection between the electrodes and the ECG electronics, these connections are integrated in the fabric of the shirt and cannot be felt. As shown in the figure, the shirt can be worn discreetly under everyday clothes, even during a physical workout. Currently, a pulsoximeter is employed to measure the oxygen saturation of the blood. The sensor front-end is embedded in a finger clip, which is applied to a fingertip. Like the ECG data, the data gathered by the pulsoxymeter are transmitted wirelessly via Bluetooth. A standard smartphone with a Bluetooth interface is used to connect with the two sensors and record their data. In the near future, the front-end will be integrated with the plethysmograph wristband, making the finger clip no longer necessary. The pulsoximeter not only measures oxygen saturation but also provides the pulse wave curve. Combining the pulse curve with peak data from one of the ECG leads, the so-called pulse transit time can be calculated. Based on this value we are able to estimate an equivalent for the diastolic and systolic blood pressure. The calculations are done by an application on the smartphone, and require a precision of one millisecond. This is achieved by using special Bluetooth modules in both sensors that are able to synchronize the measured data. The smartphone does not require a special Bluetooth module. The smartphone continuously shows the patient the values of blood pressure, pulse and oxygen saturation. Via the GPRS or UMTS capabilities of the smartphone, the whole data set can be transferred to an internet-based server. This allows the physician in charge, the insurance company, the hospital or personal trainer to monitor the patients data via an Internet browser. The Internet communication is encrypted and meets the security requirements of the German government. The data is stored as an electronic health record; the patient then has ownership and control of this record.. The patients self-determination and freedom of decision are reflected in the treatment of choice. Patients can choose the simple observation of vital data, can request a response from a physician concerning his condition or can communicate via smartphone with the doctor and discuss further steps of therapy. A doctors response can range from mere medical consultation to a call for the ambulance. This means that patients are free to decide to what degree the system affects their lives. The Mobile Health Assistant merges two projects: senSAVE®, undertaken by five Fraunhofer Institutes (Fraunhofer FIT (St. Augustin), Fraunhofer IAO (Stuttgart), Fraunhofer IBMT (St. Ingbert), Fraunhofer IIS (Erlangen) and Fraunhofer IPMS (Dresden)), and the digital patient assistant project at the Fraunhofer ISST (Dortmund). The Mobile Health Assistant was presented at CeBIT 2007.